More than half of the assessments that myself, and our team, go on include web applications. Even on network level assessments, as we identify live machines within a target network, it’s fairly common for us to find a large number of web applications. These web apps can be their own application for the customer’s purpose, or web front ends for various appliances (switches, VOIP phones, etc.). I needed a way to be able to quickly get a quick look of all the devices serving up a web page, which would allow me to try to figure out the websites to prioritize. Tim Tomes developed an awesome tool called PeepingTom which does what I needed. It works great, and I recommend everyone check it out. However, PeepingTom requires PhantomJS, and needs to be downloaded separately. I’ve had a couple issues where it fails to grab a screenshot of the web application, and it intrigued me. I started researching different ways to take screenshots with a python script, and stumbled upon Ghost.py. 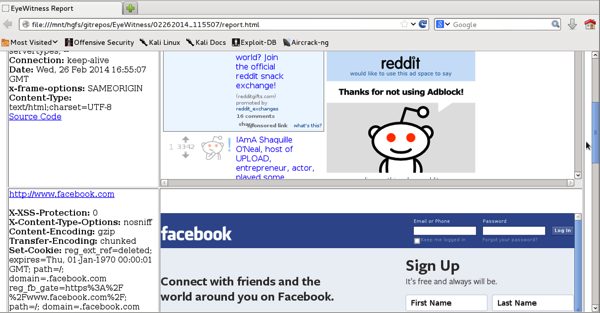 Ghost is a self described “webkit based scriptable web browser for python”, and is able to very easily screenshot web pages. At this point, I thought it would be a fun task to try to create my own tool which captures screenshots and generates a report as a thought exercise, and the end result is EyeWitness. EyeWitness is designed to take a file, parse out the URLs, take a screenshot of the web pages, and generate a report of the screenshot along with some server header information. EyeWitness is able to parse three different types of files, a general text file with each url on a new line, the xml output from a NMap scan, or a .nessus file. Jason Hill (@jasonhillva) worked on creating the XML parsing code for EyeWitness, and provided a lot of feedback throughout writing it. We also compared the results of both the XML and nessus parser to Tim Tomes’s in PeepingTom, and they are near identical, so we’re happy with the parsing capabilities. In addition to providing the file name, you can also optionally provide a maximum timeout value. The timeout value is the maximum amount of time EyeWitness waits for a web page to render, before moving on to the next URL in the list. EyeWitness will generate a report based on the screenshots it was able to grab, and will provide the header information alongside it. The report is extremely similar to PeepingTom’s output because I honestly thought it contained a lot of useful information. There is a couple things EyeWitness does to differentiate itself. EyeWitness is able to identify web application default credentials for the web page that it is looking at. When EyeWitness recognizes a web application, it will provide the default credentials along with the server header info. Currently, EyeWitness has a small number of devices/webpages it can recognize in its signature file, however, that’s simply because I don’t have direct access to other machines at the moment. Also, screenshots captured by EyeWitness are near full-size of the web application itself, and contains the entire page of the URL specified. You’re able to easily look at the full screenshot by moving the slider around within the table, or simply click on the picture and access it in its own tab. Another option EyeWitness provides is the ability to open all URLs within a web browser (on Kali) automatically, as it goes through the list of URLs. So, as the tool runs, an iceweasel web browser will open tabs of all the URLs you provided within the input file. I’d like to introduce a call to action. As you find web pages that use default credentials for a web app, or networked devices, I’d love if you could send me the source code of the index page, along with the default credentials, to EyeWitness [at] christophertruncer [dot] com, or simply send a pull request to me with the signature you created in the signature file. As I encounter applications with default credentials, or I am sent them, I will update EyeWitness to be able to identify and provide those default creds. To add signatures to the signatures.txt file, simply add the “signature” which is used to uniquely identify the web app/device on a new line, use the “|” (pipe) as the delimiter, and then add the default credentials on the same line. Thanks again for checking EyeWitness out, and hope that it can help you out on assessments! A slide deck I made for a NOVAHackers presentation is available here. I did try it briefly, but it uses PhantomJS, which is what I wanted to avoid due to the problems myself and others have encountered with it. Trying it out now. Working out great! Nice job Chris! thnx for this useful app! would one be able to autamatically report a specified wep-page on regular intervals? and if not wouldn’t it be a nice idea to report what happens on a web-page during a day/week/year? does a tool like this exist? No, it’s not possible to do that right now. The timeout is how long it will wait to attempt to load the web page before moving on to another web page. But it’s not configured to wait a year, day, etc. and see if there are differences. but would it be possible with combining a light-weight-calender-alarm (orage-clock/calender as a example) to give the screenshot-command at a certain interval, like every 2 hours or something like that? The easiest way to do this would be to just write a quick bash script that calls EyeWitness every X hours, days, etc. It’s not functionality that’s in EyeWitness currently. Thank you for this awesome software. I am enjoying while screen grabbing hundreds of dark web sites. it works if I crawl a few sites (even 1000-2000, but not 10.000!). Anyway, I have the screenshots and the .onion.txt files. Is it possible to create the report ex-post? You can always run the Recategorize.py script and pass in the ew.db file from your scan. EyeWitness will recreate the report with that.